Tendering and procurement for this project was handled by the construction companies Project Manager and Engineering Buyer. 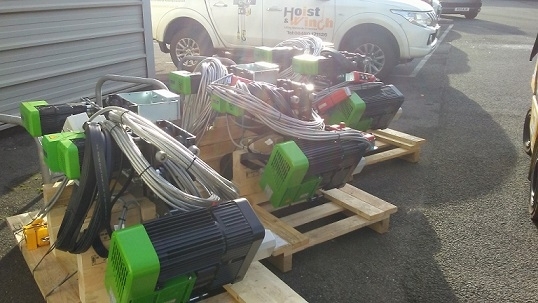 The tendering process called for Hoist & Winch Ltd to assist the construction company in selecting the correct piece of equipment in terms of critical dimensional criteria and again various operational characteristics required to satisfy the numerous challenges experienced for electric chain hoists for big bag applications. These discussions included advice being given by Hoist & Winch Ltd on the control of hoist units by remote radio control versus 2 off wall mounted fixed position pendants, hoist electrical power supply feed options, and checks on headroom clearances to ensure adequate clearance being provided for the required big bag lifting application. After these detailed discussions the Stahl STB series big bag handling electric hoist was selected. On this occasion, all hoist units were installed by our customers on site construction team, including the dual pendant control stations supplied for each unit, which were designed and supplied by Hoist and Winch Limited. Specification: 8 metre lifting height, 2 off wall mounted pendants per hoist unit, including pendant selector switch, 400v 3Ph 50Hz power supply, hoist geared limits and chain boxes.